Sometimes you just want cake, right? Actually, to be honest, I never really crave cake or think about it much, but definitely still enjoy eating it from time-to-time. But, homemade grain-free cakes can be a bit of work to make, so this 5-minute grain-free mug cake is ideal. I actually bumped into this grain-free mug cake on the blog, Writing in White. I felt intrigued to try it, especially because it only made one serving and took no more than five minutes total to make. I tweaked the recipe a bit to make it my own, and what I’m sharing here is my variation. Full credit and inspiration still goes to Writing in White though. The whole process did indeed take five minutes or less and was so easy. 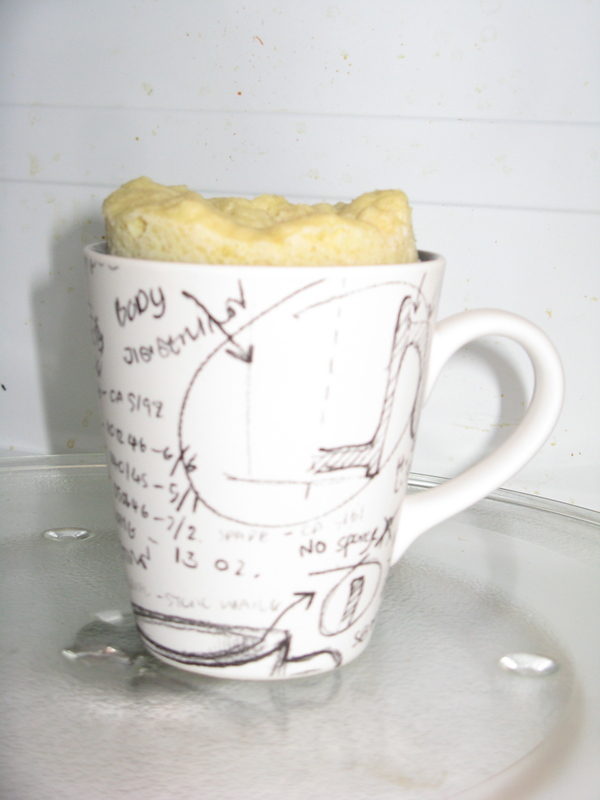 It could literally be called, “mug cake for dummies.” The coolest part was watching the cake puff up in the microwave. The mug was about half full of batter and then suddenly, it became all puffy and was standing up out of the mug — kind of like a soufflé. The cake tasted good, almond-y and subtly sweet, which is good for my taste (I don’t like stuff too sweet and my taste buds have adapted to less sweet). I loved it with the fresh berries, but it would also be wonderful with cacao nibs and/or coconut milk whipped cream…or all three! Grease mug with a small amount of melted coconut oil and set aside. Whisk together all the ingredients in a small bowl, except for the berries. 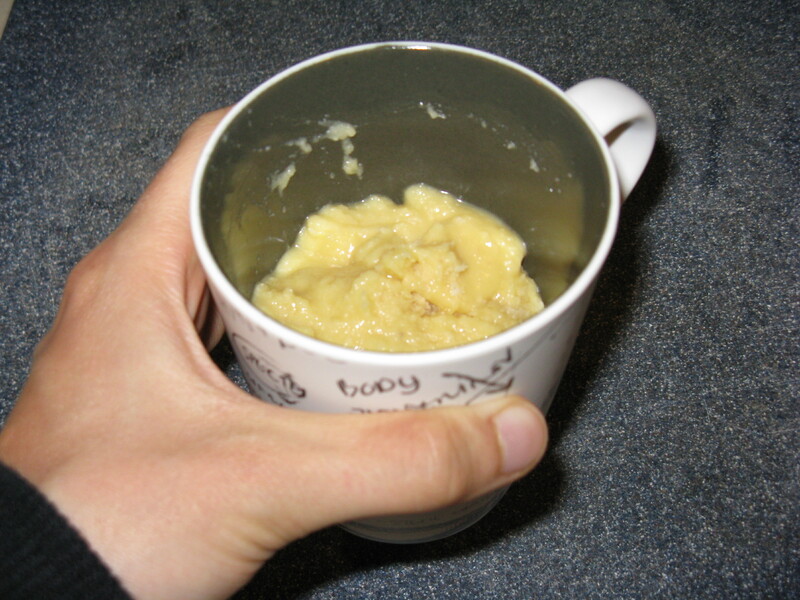 Transfer into the greased mug and microwave for 90 seconds, until mug cake puffs up and appears fully cooked. Serve with fresh berries and enjoy! I’m glad the recipe worked out for you! Yours turned out much prettier than mine did! You think so? I thought yours looked beautiful, especially the way you had it styled. Thanks for sharing the recipe! Holy frijoles!!!! This blows my mind. I am totally giving this a try!!!!! I bet putting the fresh berries inside the cake would taste like a cobbler!!!! Mmmmm. Ooo … I like your thinking! If you try it with berries inside, let me know how it works out. That’s a great idea! That looks great! And so simple. Definitely a quick breakfast option once school starts! Thanks, it’s SO easy to make! Definitely a great, quick breakfast option. I think it’d be really good with coconut butter drizzled on top too. I am such a sucker for that stuff. Thanks for sharing – this is absolutely delicious! Made this not even 10 minutes ago and it’s gone between me and the hubby. Changes I had to make were: 4 tbsp shredded/desiccated coconut, 2 tbsp coconut flour, increased to 2 eggs, 1/2 tsp baking soda, and 1 tsp of honey. I cooked mine in a tall mug sprayed down with coconut oil and at 90 secs. It puffed up beautifully! I took it out of the mug so it could cool down and then I drizzled a bit of honey on my half of the cake. I have made the cake in a mug recipe before, but this is the first time with a non-grain flour nor cocoa. It’s wonderful! I will try this again tomorrow with the leftover blueberries from our Farmers Market. This is fantastic! I defrosted some frozen berries in my mug then poured the batter on top. It in indeed a bit like cobbler. Yum! I followed a couple of your substitutions and it turned out great! Did this recipe get pulled? All I can find are the pictures.